Ahoy, mateys! James Patterson’s newest novel for “Kidds” is out! | Teacher Geek is Chic! Ahoy, mateys! James Patterson’s newest novel for “Kidds” is out! Hijinks on the high seas! Surfer pirates! Monet, Manet and van Gogh! Underwater treasure and undercover agents! Mouthwatering Cheeseburgers in Paradise! And four fabulous Kidds! From the fertile mind of James Patterson, the #1 New York Times bestselling author of Middle School, the Worst Years of My Life and I Funny, comes Treasure Hunters, the story of the four Kidd siblings — Tailspin Tommy, Storm, Bick & Beck — who have grown up on their parents’ boat, traveling the world and hunting for treasure. The action starts immediately when first their mother is kidnapped and then their father disappears. The Kidd siblings begin their quest to journey wherever they must to seek the most important treasure of all — their missing parents! Through it all, they are exposed to some of the greatest ACTUAL treasures of humankind: van Gogh’s Starry Night, the Minoan Bee of Malia, and Cordoba’s Lost Fleet among many others. I am one of ten teachers designing educational support materials as part of the “Treasure Hunters Advance Team.” Click on my Treasure Hunters Pinterest board with links to some of the fascinating and numerous references Patterson weaves into his tale. Treasure Hunters provides a Humanities education in a rollicking good story! 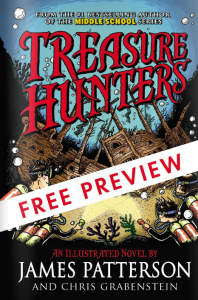 As a fifth grade teacher who has already had her students read the first ten chapters of Treasure Hunters online, I know this is an engaging novel which students will not want to put down! The book is on sale as of Monday, September 16, 2013! Go to Amazon.com to order a hard copy or Kindle version, or to Barnes & Noble to order a hard copy or Nook version. Both sites also offer a free preview of the first ten chapters.